Old-time fiddle music is for dancing. No one has ever been able to sit still while hearing "The Arkansas Traveler" or "The Eighth of January." The rhythm of these fast tempo hoe-downs or the smooth waltzes like, "Over the Waves" or "Peek-a-boo Waltz," all have urged listeners to participate--to grab a partner and get on the floor, to jig solo or, at the very least, to tap their feet, drum their fingers or sway in time to the music. The lively notes or the plaintive tones from the fiddle have been captivating listeners for hundreds of years, demanding complete surrender to their influence, not in just a passive listening capacity, but actively joining in so that the clapping hands and dancing feet second the fiddle's lead. Even today let a good old-time fiddler strike up an old hornpipe or schottische tune, and watch heads turn his way. Watch people gravitate toward him, and, if there is space, join the square that will form while someone calls off the figures of the group that suddenly becomes a single unit led on by the music. The fiddler holds his magic sway until the last note dies away when lowering his fiddle and bow, he becomes an ordinary mortal again. Holding this much influence over modern audiences deluged with entertainment and music on all sides, it is easy to understand how much importance was placed on the fiddler many years ago when he was about the only music or source of entertainment around. The fiddler was in great demand in pioneer societies which were starved for recreation. His small, light weight instrument was easily brought west in the wagons, and its music was a welcome antidote for the lonely days of labor. 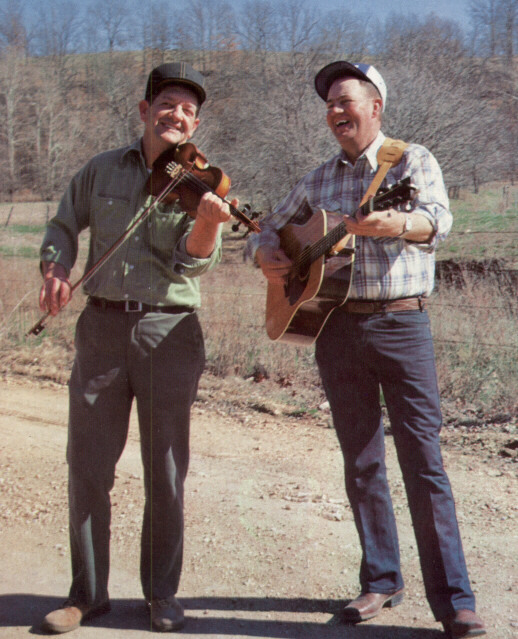 In the Ozarks there were probably no communities that were without a fiddler. Some people might say they had none because fiddling was against their religion, but the fiddler was there. In rural societies fiddlers usually had a high place, like doctors and judges. Even down through the generations this importance of fiddlers remained. One will hear names of fiddlers mentioned a generation or more after their deaths. "He's a good fiddler, all right," someone might say of a contemporary musician, "but he ain't as good as old Uncle Sam Weatherman." The reputation of some especially fine fiddlers becomes folklore or ends up in literature, such as Hill-Billy Jim who played nonstop all night to a spellbound audience, in Stephen Vincent Benet's poem "The Mountain Whippoorwill." Fiddlers were put on a pedestal, and even today some fiddlers have big egos because of their traditional high place in society. Though the music of the fiddle brought pleasure to the listeners, it was serious business to the fiddler, a part of his life. Most picked up the skill when quite young. It was often a family tradition and one they continued all their lives. Blindness, loss of fingers or other infirmities rarely stopped them. Perhaps as they got older their skill deteriorated, for there was no way to compensate for hearing loss or arthritis in their fingers, but they were still in demand and still kept their fierce pride in their ability. There were many black fiddlers and Indian fiddlers. Most fiddlers were men, but a few women played, though rarely for dances. Part of the pleasure the fiddle brought to people was because of its versatility. It can make many sounds--joy, humor, love, sadness, loneliness. It can sound like bagpipes, the fife and drum and can even mimic sounds of animals. It can play soft lullabies, ballads and popular songs of the day. When the party line came in, telephones were used sort of like the radio was later. Ten to fifteen families on a line could all listen in. On lines like Slim Wilson's line, the neighbors would get a treat. The Wilson family that lived near Nixa, Missouri, were all good musicians, and when they were ready to play, they'd signal over the telephone line. Everyone would take down the receivers and listen to the Wilson family fiddling. Some would let the receiver hang down in a bucket to help amplify the sound. Probably most important, however, the fiddle can provide the music for the dances which were often held after house raisings, shucking bees and other community working activities as well as at picnics and celebrations. But there needed to be no special reason for a dance. Some couple would move their furniture out of a room, invite the fiddler and simply have a dance. In the Ozarks square dancing came first, then round dancing, the term used when referring to waltzes, two-steps and more modern dance steps which need only two people rather than the group for a square. But perhaps the main step that was used with the fiddle was old-time jig dancing. This kind of dancing is about gone. In some ways similar to Georgian clog dancing, the Ozark jig step was perhaps more creative. Each dancer had his own individual style which was as individual as the music itself. Usually the dancer was smooth, making all the seemingly effortless movements in his legs and feet. When ready for the dance, the dancers would form into a square of four couples. Usually one of the dancers within the set called the dance rather than a central caller. In order to give dancers time to solo, the caller would call dances that featured one couple at a time ("Lead her up into the hall, Lady go gee and gent go haw"), or a single dancer ("Bird in the cage and three hands round, Bird hop out and crow hop in"). Usually on the sidelines there might be individuals of any age, jigging to the music, and perhaps some clappers and stompers helping the fiddler keep time. During the dance, which might last as long as twenty minutes, the fiddler had absolute sway over the dancers, jiggers and other participants, dictating how fast or long by his music. Sometimes dancers would get carried away dancing set after set all night, wearing out the fiddler. If there was another fiddler there, one fiddler might play until he got tired, then the other would take over. Sometimes musicians would just quit because the dancers would wear him out. Without a fiddler, the party was over. Dances were usually open affairs, for it was difficult to have a private dance as word would get out. The whole community was invited, anyway. There were often bad opinions about dances because of the trouble that resulted from drinking and fighting. Church people tried to do away with fiddle music and dancing. Many communities got around the fiddle stigma by having play party games, which were actually square dancing figures done to the music of the players own singing rather than a fiddle. But the popularity of the fiddle and square dancing did not give way even though it was continually condemned by many church people and preachers for many years as the open door to perdition. This determined crusade against the fiddle itself was an admission of the importance of the fiddler. The melodies, those who condemned it said, were like the wailings of lost souls. The devil himself was speaking through the music of the fiddle. The fiddler, in bringing out the tantalizing sounds, was leading the listeners to everlasting horrors. Most people did not really believe this, but obeyed the church's restriction on this as they did the ban on whiskey, gambling and other sins. One conscientious church woman and her daughter were at a party. She was enjoying the socializing, and when the fiddler began, rather than leave, she made her daughter turn her back to the music. There was drinking at some dances, which occasionally led to fighting. Perhaps the fiddler imbibed along with the others. Fiddling is hard work and hospitality required the host to "Give the Fiddler a Dram." By the end of a long night, he might have drunk quite a bit. Often a fiddler would play for five or six hours. Some fiddlers had an amazing repertoire of tunes to draw upon, others knew only a very few. The demand for a fiddler was so great that the dancers didn't care if he played the same two tunes over and over. But good fiddlers knew many tunes. The average fiddler probably knew seventy-five to a hundred tunes. When asked today most old-time fiddlers will say they know two hundred and an especially fine fiddler may have a reputation of knowing five hundred. Obviously, the fiddle itself is very important to the fiddler, and he usually has great affection for it. At a dance, when a big fight started, one fiddler grabbed his fiddle and ran. He got about a mile away before he remembered he had left his girl! Young boys learning the fiddle sometimes had to play it over a feather bed to protect it in case they dropped it. Sometimes boys had to demonstrate their interest on a less valuable instrument. 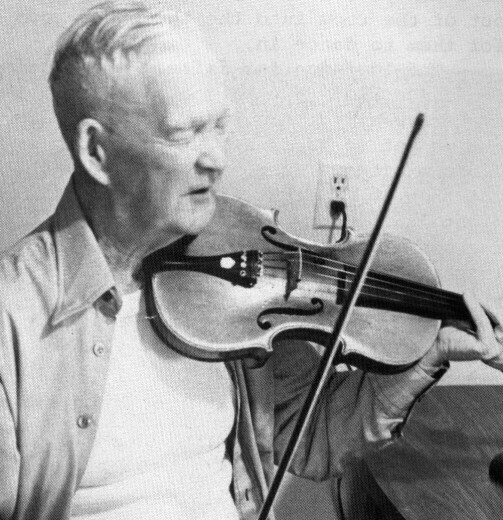 As a young boy of about seven, Bill Graves wanted to play his father's fiddle, but his father was afraid he would hurt it. Instead he let him play the homemade mountain dulcimer his grandfather made. When Bill got older, he learned the fiddle and has been playing ever since. Most fiddlers prefer to play with a second of some kind. A second is a common word among musicians meaning an accompanist. The seconding instrument is like a metronome to help keep the fiddler in time. If the community was lucky enough to have two fiddlers, one would second the other. This method of bowing a full cord rather than individual notes to provide rhythm for the lead fiddler was referred to at times as "skillet licking," so called as this style was used by the Skillet Lickers, a popular string band of the 1920s. If both fiddlers were good, they'd trade off seconding and leading. Usually, however, the seconds were younger family members as fiddlers often came in families. Without a second fiddle, sometimes another musician would drone or hit on the same fiddle the lead player used. The lead would play on two sets of strings and the second, using knitting needles or wooden sticks, called fiddlesticks, would beat time on the other strings. Other rhythmic devices were also used as seconds, such as spoons and jaw bones. The pump organ and piano made good seconding instruments. After the turn of the century the piano became popular as a second since the piano can follow the fiddle in all the intricate runs. Another common second was the homemade banjo developed by the slaves. The banjo was used as a second even before guitars which did not come into general use in the Ozarks until the end of the nineteenth century. Today the guitar is the most common seconding instrument to the fiddle. The tradition of old-time fiddling is hundreds of years old. The times and style have been handed down from generation to generation, first in Europe and then in America. 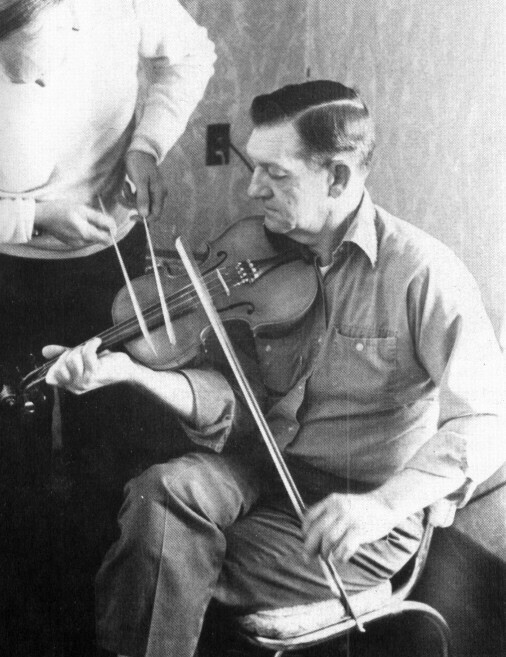 Old-time fiddling developed in isolated rural communities where the growth of tradition is natural, and where the music style had time to develop. This type of music was slow developing and spreading, in great contrast to the various styles of modern music which are popularized quickly and just as quickly go out of style. The instrument itself developed in Italy in the Italian Renaissance from the lute family, only it was played with a horsehair bow. The violin that emerged around 1550 was used exclusively as a dance instrument in the early years. Its popularity as a concert instrument came later. During the nineteenth century violins were altered to increase the tone power for performing in the large concert halls. The bridge was made higher, the neck and finger board tilted back and a chin rest added. The strings were made of steel instead of gut and were placed under greater tension. The fiddle and the violin are, of course, the same instrument, fiddle being the popular name in colloquial speech. The word fiddle is applied more to common folk who play by ear, while violin is the term used for the European art instrument which took its present shape at the end ,of the sixteenth century. Fiddles were newly popular when our country was first settled, so it was logical that early settlers brought fiddles with them. In New England as early as 1661 there was mention of fiddling and in 1663, even mention of an Indian fiddler. The fiddles replaced the more difficult to play bagpipes, which were the instruments of the common people. At first fiddlers and pipers had a common repertoire as it was easy to transfer bagpipe music to the fiddle. Old-time fiddle music is reminiscent of bagpipes, repeating a theme and varying it slightly, then repeating that. One such tune played by both instruments is "Money Musk." It seems that the fiddle's bad reputation began very early. In 1699 in Massachusetts Bay Colony there were laws against fiddling. Fiddlers were mentioned along with jugglers, psalmists and other "lewd, idle and disorderly persons" as the kinds of people who cause disturbances and who should be placed in custody. The New England fiddling was influenced by French Canadian fiddlers and by the influx of Irish and Scots who immigrated later. By the second half of the eighteenth century, American fiddlers were playing jigs, hornpipes and contradances. 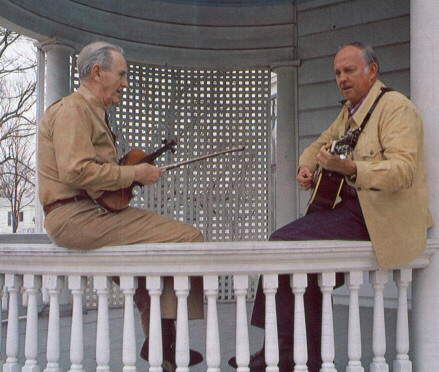 Art Galbraith (left) and Gordon McCann pause a moment on Art's porch this early spring day while playing their favorite kind of music--traditional fiddle music. As the tradition of fiddle music moved from England first to New England and other eastern seaboard states, then to the Appalachians and consequently to the Ozarks, there were local influences that gave different characteristics to the music in different geographical regions, though the music has a characteristic style. American square dance tunes learned by ear have a distinctive type of rhythm differing from jigs, reels and hornpipes of other countries. American tunes have a definite ending and repeat. Dance tunes from other countries, especially Scotland and Ireland, play round and round to the end. Typical Ozark tunes are dance tunes--hoe-downs, reels and hornpipes. Old-time fiddlers have a different way of bowing and using their wrists. Some do not tuck the fiddle under their chins, but hold it lower, playing with quick short strokes. A concert violinist could play note for note the same tune, but the music still would not sound like the old-time fiddler who plays by ear because of the different techniques and the freedom not permitted to those who follow printed music. One old fiddler expressed it when asked if he could read music. "Well, not enough to hurt my playing." Frequently Ozark fiddlers flatten the bridge to allow several strings to be played together. They often use drone strings and a great deal of rosin on the bow to keep the bow from slipping. They use so much that the fiddle often has a chalky look to it. Perhaps the main characteristic of Ozark fiddlers is their individuality. They are influenced by one another, but are not imitators. Fiddle tunes, like the words to ballads, are always changing. Each fiddler zealously guards his own style, playing his favorite tunes his way. He takes great pride in his playing. A fiddler would rarely say he sounds like another fiddler, though he won't mind being compared to one he thinks is better. Each has a favorite piece he does well. Most fiddlers will not try to play some piece if they think a fiddler around them can play it better. Even though the fiddlers are great individualists, they are influenced by other good fiddlers. Today with radio, television and especially the tape recorder, that influence is much greater, but in spite of that influence for conformity, the better old-time fiddlers of today each have a definite style which is easily recognized. 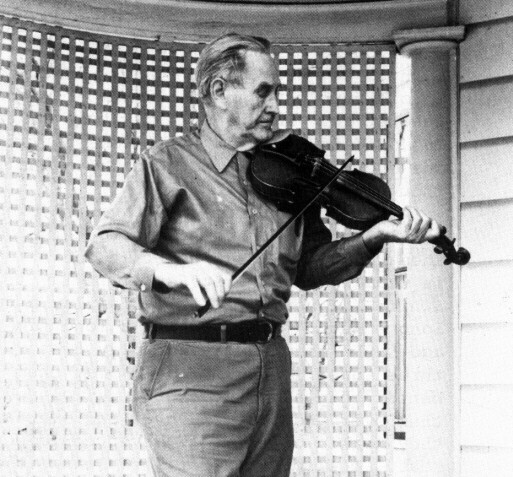 One of the outstanding fiddlers who influenced the music in southwestern part of Missouri was Lonnie Robertson who died in the spring of 1981. Born at Seymour and raised at Long Run, he learned the traditional tunes, and then turned professional, playing all over the country, including north Missouri where there is a different style. 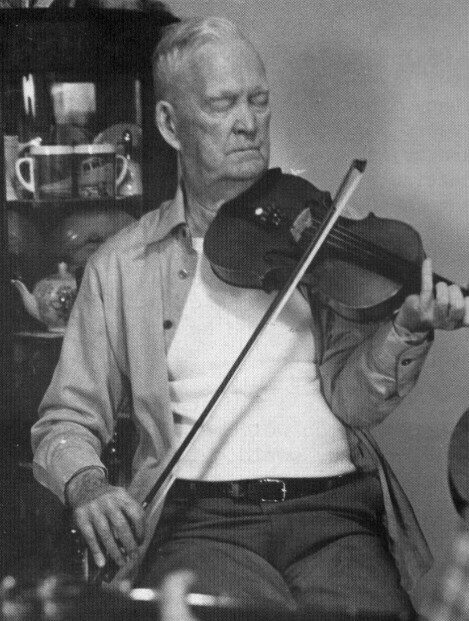 When he came back to the Ozarks, he brought a lot of different tunes back with him, influencing the Ozark fiddlers. Old-time fiddling and square dancing have little to do with present country western music. They pre-dated modern country music by centuries. The old-time fiddle music is the original ethnic music of the settlers which they adapted to their needs and resources. Country western evolved from a blend of various types of music, one of which was square dance music. String bands and bluegrass music developed from the fiddles and their seconds, but none of these modern types of music replaced old-time fiddling and dancing. Bluegrass style of playing developed from old-time fiddling. Neither uses printed music. Neither uses amplified instruments such as electric guitars or basses. Neither promotes fancy costumes. Bluegrass's main idea of new material is old tunes rediscovered. But there the similarities end. Bluegrass is to be listened to; old-time fiddling was for dancing. Bluegrass has several instruments of equal importance, alternating solos; the fiddler was always the solo since those accompanying him were solely support and complement. Bluegrass uses harmony singing with a great many gospel songs; old-time fiddling seldom has singeing and religion rarely played a part. The breakdown of community structures and of the traditional family, both of which foster and preserve traditional ways, have almost done away with the old-time style. Our greater mobility, radio and television have given us wide choices of recreation and entertainment. No longer dependent on the neighborhood fiddler, our society, surfeited with new music from every side, discourages young musicians from even knowing about the old tunes and styles, much less making them desirous of playing there. There is, however, one influence which may help preserve the old-time fiddling--the revival of interest in folk music, which has led many young people to take up the fiddle. There are very few real old-time fiddlers today. There has been a great revival of fiddling among today's young people, but few of them are learning the old-time style. The competition on television, radio and at music festivals from bluegrass, new grass, western swing, and a contest style some call "progressive'' fiddling is too great. Our traditional fiddling has all but been pushed out of the picture. Old-time fiddlers, though few, are by no means gone yet, and they love to play. The fiddler looks out into space as his fingers fly over the fingerboard and his foot keeps time. He saws out tune after tune, waltzes, hoe-downs, jigs schottisches, polkas, and even to satisfy young listeners, some modern tunes. Everyone within hearing distance is mesmerized by the lively rhythm which will not allow anyone to sit still. Toes tap, fingers drum, hands clap, and an occasional old-timer jigs along to the dictates of the fiddler. Confident in his skill and mastery of his instrument, the fiddler plays on. Like a Pied Piper bringing all within hearing distance under his spell, he knows he's king of the occasion, and even today he still holds the legendary spot of importance in his community because of the magic of his music. Be he a dairy farmer like Bob Holt, a retired postal employee such as Art Galbraith, a retired railroad engineer like Glenn Rickman or a city employee such as Jimmy Gage, each one in his own community and in his own style carries on the tradition of the old-time fiddlers. 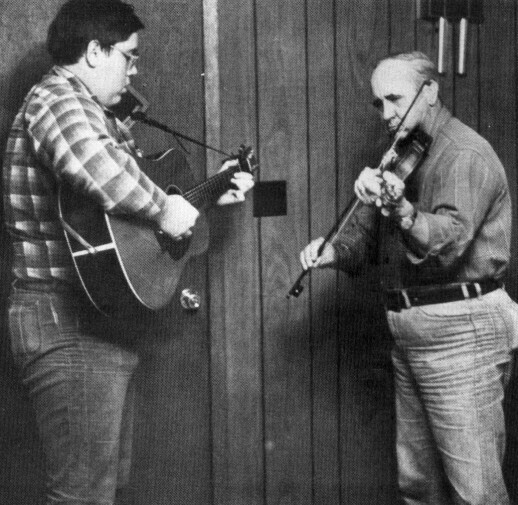 Above--If a community was fortunate enough to have two fiddlers such as Jim Smith (left) and Jimmy Gage, one would second the other. Another method of seconding (below) was "fiddlesticks." Gordon McCann beats the time with knitting needles while Bob Holt plays the melody. "I would rather have a guitar seconding me," Bob Holt said. Alvie Dooms can often be found seconding Bob wherever they play. I had just about quit playing the fiddle when the kids from the Frontier Folklife Festival in St. Louis came along. This folk revival stuff is the greatest thing that happened as far as I'm concerned. I was really pleased to see it. That has kind of got me started again because my first love and what I really like, and when I sit around with myself and play, is these old tunes that I learned from my dad, my uncles and people like that. There's more thrill and I just get more out of that kind of music. It's got more feeling to it for me. There's more expression to that than there is to all this commercial stuff, as far as I'm concerned. And I'd much rather go to somewhere like a folk festival and play for just a break-even trip as to play commercially for quite a lot of money. In fact, I wouldn't play commercially at all. I just don't care anything about it. I went that route for awhile and I didn't care for it. I learned to play when I was about fifteen or sixteen. I was playing the harmonica a little ever since I was probably four or five years old, and then I started playing the mandolin. But my dad liked the fiddle, and he insisted on buying me a fiddle. For a long time I didn't care about it. I'd try to play it a little--just something to satisfy him--but I really didn't care much about it. Eventually I just got to playing it more and more and let the mandolin go. I'd imagine I was playing for dances by the time I was seventeen. I'm fifty now. There was a period of time that we just had a few, really old-time fiddlers, and no new ones at all. I had an uncle that was a real good fiddler, but he lived up near Springfield, and then we didn't get together very much. I learned several tunes from him. He'd come down and stay two or three days with me, and I'd learn some tunes. Then I had an uncle that lived just down the road that played a drop-thumb five string banjo. He was the best drop-thumb banjo picker I've ever heard. He could play note for note just like a fiddle, as near as you possibly can without a bow. I learned a lot of tunes from him. I played with him quite a bit, but there was a period of time after the twenties that all these old groups, the Skillet-Lickers and Good-Timers and a bunch of them that recorded in Atlanta was real hot until the Depression come. When the Depression come that blowed the record market, and they all quit recording. Then what little I picked up was just off the radio because there was no new records. My grandma had all the old novelty records and all the old fiddle records. I learned a lot of my stuff off that, but I learned just from listening and trying to duplicate the sounds. I've learned just about everything I know just by hearing it and keeping on till I got the sound I thought it sounded like. 'Course everybody interprets the sound differently. A lot of these old tunes I play I don't know too much about. They're some I learned from my uncle that was prerecord. I mean they was before the record boom come along in the twenties--the Skillet Lickers and Hank Robertson and all them started then. In fact, they had the first record in about '21. But a lot of them tunes my uncle played before that. Then after that a lot of the tunes are influenced some by the records because when they start coming out by one fiddler or one band, and other people started hearing them, they all started learning off of that record. Before then it had just been from one fellow to the next--generation to generation. These records that they've made in the last fifteen or twenty years, I never even fooled with them at all, didn't ever bother listening at them or trying to learn them. I might listen at them once but not enough to where I'd try to learn them or anything like that because they've started changing the tunes. These tape recorders have changed everything. Gordon will send me a tape with a good tune on it and it's my kind of tune, I listen to it and play with it. That way you don't waste all your time. 'Cause when you get together time's limited. If everybody will practice--take a tape and sit down and play with it--then when you get together it's just a matter of smoothing it out. Then you pretty well know what's going on. I would have give anything to have had a tape recorder and tape the music of my uncle, and different old-timers around here. I've got a few tapes of the ones of them that was left. A lot of them was real old and it was getting to the point to where they wasn't too good anymore. I think that what influenced my fiddling was my dad's whistling. He came here from Tennessee and my uncles was both real old-timers. That early influence give me the style and the timing. There's been other stuff crept in because I've listened to a lot of music. I've played for enough square dances over the years. In fact, I had trouble playing any kind of listening music for a long time, waltzes or anything that was slow or smooth. Alvie, who plays guitar with me, and I were fortunate enough to be the last of the old bunch that's seen the way the old-timers lived. When we got bigger, we saw we didn't have to live that way. We know how its done. We know all the old stories. But I've tried to keep my tunes as I heard my dad whistle them. He couldn't play any instrument, but he had a perfect ear for tunes. He could whistle a tune, every lick of it just like a fiddle ought to play it, just perfect the way a fiddle would go. He'd make me stop and start over if I done it wrong. And when I got to learning tunes off the radio, maybe changing the old tunes I'd learned to hit a little bit, he'd say, "What makes you think that they know that tune a better way than I do. I've known it just as long as they have or longer." So I finally realized the truth and the good part of that, and I kind of stayed with that. I've tried to keep from it, but you can't help but be a little bit influenced by so much of the stuff. It would be hard for me to describe my style. I don't hear that much of my own. When you're playing it yourself you don't hear it the same way that you do off a tape. And oddly enough I rarely ever tape my own stuff and listen at it. I should because you can correct yourself a lot of times. I would say that my style was developed more from the Appalachian's style. It's what they used to call in the '20s Georgia style. It's a fast bow cut. It's got rhythm that you don't find in any other types like Texas fiddling or north Missouri fiddling or anyplace else. It's a rhythm to put your foot down to. It makes you want to dance. It may not be perfect in tonal quality and it may not be perfect in anything else, but when you get out on the floor, Dad always said you had to have someplace to put your foot down. In listening to the old Skillet-Lickers, now they had that short Georgia fast-type music. My fiddling kind of goes in spurts. There's be a long time, maybe a couple of months at a time, I won't fiddle at all. But we've been going to St. Louis for the last three years to the folk festival. I've been more active. Actually twenty years ago or so I was in Iowa. For ten or twelve years I played in a country western band. It was always a part-time thing. I really didn't like that particular type of playing, but there was a lot of Missouri people and Mississippi and Tennessee people up there and they followed us from club to club so they could square dance because I was about the only square dance fiddler around. 'Course I helped the other band. We had a regular country western band, steel guitar, lead guitar. Then I played bluegrass for quite awhile, but then bluegrass got so progressive that I didn't care for it anymore. I just about quit except for some occasional old-time playing around here or at a folk festival. There's several different little groups around the country and I'm impartial. I play with any of them that invitees me. We're all friends and have helped each other out from time to time, and if they have company in or some special occasion and want some music why I go help them. But, you could play every night for free, if you wanted to. I play with this bunch that goes and square dances. I play for them 'cause I enjoy watching them and enjoy the people. I could be working about all the time playing for hire for square dances but I just don't care for the job anymore. I play with Gordon McCann and Art Galbraith and the boys down south here, Lonnie Robertson's kinfolks and the bunch down there. That's about all the playing I do. But Gordon, he's awful bad about sending me good tapes. Then I can't rest till I learn it. I would rather have a guitar seconding me. I love to play with the right kind of a drop-thumb banjo picker but not the steel. I don't care too much for some of the new. I've played a lot with the bluegrass music, but I just don't care for the tone of the banjo or their rolls which cover up the melodies too much for me. The old drop-thumbers, you could hear that tune, and it had a deadened, softer quality that didn't conflict with the fiddle. Now these banjos with steel on them and especially down in the higher registers where it gets real fine, they've got an awful lot of power and the notes is so close to the fiddle that it conflicts and covers, where the old banjo, the old soft drop-thumb, was played barehanded and just enhanced the music like a guitar or a bass. It pushed the fiddle out. It makes a lot of difference. But to go with just one instrument I'd much rather play with a guitar. And for a dance I'd rather have a guitar or a bass. I also play a bit of twin fiddles. I about always lead because I've not got a head for harmony. I never could sing harmony, therefore I just don't think harmony. We've got several tunes that we play. 'Course we don't play together very often. If we did we could work out a lot more. I really like twin fiddles. I know about three hundred fiddle tunes. That's just fiddle tunes, not novelty tunes. It was an interesting thing. I run across a little notebook I had when I was in Iowa back in '56 or '57 and had some names of tunes wrote in it. There was two or three of them tunes I'd never heard of. I'd forgot them completely. My son plays guitar, and he wanted a tape of all the tunes I could think of so he could play them at home, and he wanted to keep them. He wanted to practice on them so when he come down he could play with me. So we sat down and we put in one whole complete afternoon or maybe four hours, and we never got out of one key! One tune calls for another just like telling stories. I'm rusty on some of them I haven't played for years or haven't thought of them. But just every few days down at the milk barn, and I don't know why that brings it on, but when you're milking and you don't have much to do, I'll catch myself whistling an old tune, and stop to remember which tune it is. And it's an old tune that Dad used to whistle. I'll come up with one every once in awhile that I haven't thought of for years. I'm sure I have some favorite pieces. But it would be hard for me to think of them right now. But the last one I learn is usually my favorite until I play it awhile. I never really could play a tune long enough. Now fiddlers a long time ago maybe they could just play two or three tunes, but they could play them better than anybody 'cause they played them over and over and over and over and they worked on them. I never could do that. I'll play one 'till I learn it and can get through it reasonably well, and then I'm always wanting to learn another one. 'Course I go back over all of them occasionally but it may be years between times before I play some tunes. Some I'm sure has escaped me and got away. I like to play the fast ones. If I've got a good second I like waltzes and a lot of rags, especially the old twenties rags. They've got a real good rhythm, too. I like anything that's got a working rhythm. I call it a working rhythm anything you can dance to. I don't care anything for tunes that wander just here and there and on around through a bunch of chord progressions and never goes anywhere. You never know where it started, you never know where it's going, and it didn't say anything on its way as far as I'm concerned. I maybe can't play a tune the first time. I'd have to hear it several times, but a lot of times I'll listen to a tune two or three times and I just can't seem to get it. I used to get them off of the radio. I'd hear them and maybe it would be another month or so before I'd hear it again. Some days I would be whistling a tune and it would be that tune. It just gets in there, and I've thought about it. It's a funny thing I couldn't tell you the lyrics to a whole song, but the tune just sticks in my head. I read music. I used to play in the high school band. I played the trumpet, but I haven't read for a fiddle at all. I never did change it over. You know you'd have to adjust your noting. I'm not a reader, though I do know a little bit about music. I could play the fiddle by music if I wanted to, but I just never did want to because you lose a lot, I think. Everyone would sound the same. Now that's a funny thing about the Irish. Now they don't read and they're scattered but they're more clannish than we are. They'll sit around and talk a little bit, and one of them will start off on a tune. He'll play a little bit. They'll be a group of them, a flute and a set of pipes and a guitar and fiddle, and this other one will take up, but they play it exactly the same. Everyone of them knows the tune the same way. You couldn't get two fiddlers out of one hundred in the Ozarks that plays a tune the same way, unless they've played together. Ten fiddlers can learn a tune off the same record and all ten of them will have a different version. It's just that they interpreted the sounds they hear differently. They cut their notes different. It's more creative. There's something of yourself in that. It's the way you feel about the tune. My music is a hobby. I never get tired of playing. I got tired of playing professionally--the atmosphere and everything so I don't anymore. I don't mind playing for an outside square dance. I play like for the Glade Top Trail. It's a kind of a fall thing we have here where they go on a trail drive down in the mountains when the colors are out. They have a square dance in the middle of the town square and I'll play for something like that. I especially like to play for dances and watch them dance and I enjoy being able to make them dance and get to feel the rhythm with them. It makes a lot of difference now if three or four sets is dancing, and if you can get a good set that don't mess up and have to stop and straighten out, you get one that's hitting the floor right, and it's just as good of time as a guitar. But to fasten me up in a room full of drinking people anymore, I can't stay in there. I have in many of them but that's the reason I don't anymore. But out in the open in the public like that, it's pretty well peaceful, and I don't mind it too bad. Me and Alvie played for a couple of events up here on the public square and down at the football field last year. But other than that and when the kids come down from St. Louis or I get together with Gordon or some occasion or go to the festival I don't play much. Really the festival has been great because they probably kept me from quitting playing because I couldn't get anybody to play the kind of music I wanted them to play. I play quite a bit by myself. My dad and my Granddad both loved fiddle music though they neither one could play. My granddad kept a fiddle in his house. He lived down the road here from where I now live, and this used to be the main road from Ava down to the southwestern part of the county. There were a lot of travelers on it, and a lot of times they'd stop and stay all night. If they could fiddle, Dad said they never got any sleep 'cause Granddad would make them play all night. He always wanted "Paddy on the Turnpike." Dad was just as bad. He would dance all night and plow corn all the next day. They all loved fiddle music better than anything. That's why Dad got me the fiddle and wanted me to learn. There was a element of people who thought it was wicked to play a fiddle. There were a lot of people and I lived right amongst them who, well, they were our good neighbors and we did things for each other, but they never came when we had anything about the fiddle. They just did not. It was wicked. The devil's own box. The devil's in the fiddle and it wasn't good at all. But these play parties people had instead of dancing to the fiddle wasn't anything in the world but singing and square dancing. It never dawned on these people at all that they were square dancing. But they would sing tunes that had good time to them and you could pat your foot to them. So you did circle eights as you do in square dancing and rights and lefts and alle-mande left and all those things square dancers did. They never caught on that that's what they were doing. Anybody could go to those and it was just great, but if you just took out the fiddle and played but didn't sing, the wickedness started right there. I've been trying to play the fiddle since I was approximately ten years old. I grew up in a family who played. An uncle lived with me who played and he taught me a lot. He had a finger off. When my dad and he were little boys, he was holding corn cobs and he stuck his finger out too far and my dad chopped his finger off with a hatchet. But it got well all right. He always thought it would grow back but it never did! So then he just played the fiddle with three fingers. He was pretty good. I learned a lot of tunes from him. That was Uncle Mark. Uncle Tobe was an older uncle who played very well and played a lot of tunes. I got most of my tunes from him. My dad bought me a fiddle when I was about nine years old, I guess. I've tried on my own to play and I just picked it up more or less. I heard it and I liked it. Of course that's the key to it. I think anybody that wants to play music, if he likes it well enough he'll pick it up. You've got to like it and you've got to like it a lot and stay with it. I think a lot of kids who take music lessons are not interested in it enough Their parents talk them into it. "I'll get you a violin if you'll play it." Well, they'd rather play ball or hunt rabbits. But anyway, if you stay right in there and want to learn badly enough, go everywhere you can and listen, you can learn. Nowadays it's so much easier to pick up music than it was when I was a boy. When somebody came to the house to play or when I played with my uncle a little bit, that was it. But nowadays you can tape a tune and play it a hundred times if you want to. That's great. My dad embarrassed me by wanting me to play for people when they came to see us. I was playing by myself and it sounded horrible! "Get your fiddle, son, and play them a tune!" Well, I just dreaded it every time. But I did it and I guess it was good for me because it made me try harder. I remember one time we went to a picnic on the Fourth of July down on the James River. They brought in some lumber and laid out a frame work and built a platform, oh, maybe the length of this rug and a little wider, so a set could dance on it. They'd put a couple of boards across a little higher place for the fiddler and guitar player to sit. I went up there one time with a cousin of mine. He was there playing the fiddle for the square dance. I had learned two tunes, "My Old Kentucky Home," the first thing I ever learned, and the second one was "Little Brown Jug." He had taught me both of them pretty well, just one note at a time. He said put your finger right there. So most of the time while they were dancing, all I was doing was listening to the music. Dancing didn't interest me much. Then he said, "Come here a minute. Take this fiddle and play. I want to dance one." And, oh, it just scared me to death to get up before all those hundreds of people. I knew nearly every one of them and they knew me, but that was the worst thing that could happen. But he kept on. He said, "Why, you can do it. I showed you how to play it. Play 'Little Brown Jug'." So I got up there and the guitar player says, "Well, I'll play with you!" So I played for a square dance set. It scared me. I was just miserable. But I got through it and they danced, so I guess it was all right. And later on I played with him and others for dancing after I got to learning more tunes. Most of my playing was done at home and at the kinfolks' homes when I'd go to their houses. After I got so I could play along with them, that's really what I liked to do, playing with kinfolks and being a part of the group. Oh, once in awhile they'd get me in on playing for a dance where we got pay for it. I remember one dance we played for when we all got five dollars apiece. That was splendid pay. That big a group right now--three people--would probably get seventy-five dollars for playing. I got five dollars. I could buy some new strings. I play some other instruments too--mandolin, tenor banjo back when tenor banjo was quite the thing. I'm sorry now that I spent so much time on it and didn't spend Some more time on the fiddle. I would know a lot more tunes now if I had stayed with that rather than play the banjo. I like the banjo all right and still do. If you try to play too many instruments it cuts down on your skill. I've always liked it and still do and go everywhere I can to learn something. I play lots of records and tapes and I learn my tunes from those nowadays. Most of the time I learn a new tune on the mandolin because it's a little easier to handle if you're working with a tape or record. I play the mandolin and play the tune on it. The mandolin is tuned just like a fiddle so it's easy to transfer from the fiddle to it or vice-versa. Years ago they didn't have tape recorders or radio, so in one area, they'd learn the tune as such. Then maybe one fiddler would come through or a new fiddler would move in and he'd play a tune then move on. Well, they wouldn't quite remember what the tune was. So they'd give it a new name. That also accounts for a lot of variations. For instance, here in Springfield fiddlers would hear each other play something and soon they would play it all alike. Maybe somebody up in Lebanon would be down here. He'd hear that tune. It touched him. Well, maybe he'd pick up part of it or maybe he'd pick it all up but he wouldn't remember what it was called. That's why a tune in one locality sounds one way, and you can still recognize it, but in the other locality, it's just a different ball game with a different name and played differently. We used to play for square dances a lot. A lot of times you play for square dances you get hold of a caller that doesn't know when to stop. He'd go on forever--just wear you out. Well, you get sick and tired of playing the same tune over and over. So we always varied the tune. We either played four or five tunes in a set, or we'd play one and make some variations of it so you wouldn't play the same thing over and over. I've gone to square dances where the fiddler only knew two tunes or maybe one tune. By the time the night's over and he plays that tune maybe twenty-five times, it begins to wear on you. Anything you can do to vary it is good. I didn't do what you'd call most of my public fiddling until the last few years with Lonnie Robertson and Gordon and two or three others around here. Most of my playing was in the fifties when there got to be sort of a craze of square dancing. That's when those groups got to organizing and dressing for it--women dressing in those squaw dresses. I had a little group that started in about '48 to about '58, I guess. I played for a lot of callers teaching square dances. We played at places such as the YWCA and dance studios and anywhere a group would get together. Maybe twenty-five or thirty couples would rent a hall, and one night a week we'd play for them. They had what they call a central caller. He'd call over a mike and maybe have fifteen sets dancing around him and teach them. He'd take it slowly and go through the motions of the set while we'd just sit and rest. Then he'd say, "Let's try it for real," and we'd play for them. So after they got really proficient at it, we really had a good time playing for them. We did that several years. Then they got what you'd call canned music, records or tapes. The caller would have the record playing and call to it. They never hire music for square dances anymore. It's mostly western swing--the fast type of dances and picturesque with all kinds of figures that they try to do, whirling skirts and all that. I played at the National Folk Festival in St. Louis in '52 and '54. In '54 Rex Kreider, a really good square dance caller and teacher, took his exhibition set up there and we played on stage for them to dance. It was a very beautiful set. The women and the men were all dressed alike--all gingham shirts and that kind of thing. Then I met Gordon along about April of '76 so we've played together ever since. Gordon and I and our wives went to Wolf Trap in '79. We'd been to St. Louis a few times at the Arch at the folk festival. It's a national park now. We've got some good friends there who ask us to come quite frequently up there and play. That's where somebody got the idea to have us come to Wolf Trap which is right outside of Washington, D.C. So we went to Wolf Trap. That's a wonderful place. It's an old farm and the people who owned it gave it to the government. The National Council for the Traditional Arts was the group that asked us there. It's the only national park used for the performing arts. The most satisfaction I've ever had in fiddling is playing with Gordon. He likes to do the same things I do. We have gone lots of places together and met a lot of nice people and dedicated people. They are interesting people who are interested in the grass roots of music. When I was thirteen years old, I picked up a fiddle and I decided to tune one and I played. Dad said, "You know, son, a fiddler will never be worth a damn." I guess Dad was about right. I married Shorty--now everybody knows her by Shorty--on August 2, 1922, and I got that fiddle in 1919. That fiddle's got more seniority than she has. But she's next. She's second out on seniority. An uncle of mine got this fiddle when I was thirteen years old. Well, I struck my first tune in 1915. After my uncle died, Dad bought me my uncle's fiddle the week after Christmas in 1919. "The Mississippi Sawyer." That was the first tune that Uncle Henry taught me. And he said, "You've got to use that forefinger," and he made me hold that forefinger down in order to play "The Mississippi Sawyer." But, of course, Uncle Henry, he is done gone on. I don't know whether they fiddle where he's at or not. I hope they do. I hope they do a better job than I do at that. After I got his fiddle, boy, I started playing for dances roughshod. Me and this old cousin of mine would play for them square dances. If they was short on women, a man would just put on a bonnet. Some people didn't like dancing. But I bet that they was some of them people that went to church that if they could get away just right, they'd go dance, too. But I never did dance two or three sets. I always played. Shorty never went to dances with me. She stayed at home and kept the kids. One night she went and was setting there enjoying watching them dance and the next thing she knowed, they knocked somebody under her feet. Well, she was ready to go home right then. She never did go back any more. Losing his eyesight was no hindrance to Glenn Rickman's fiddle playing. His wife, Shorty, said, "He's better than ever for he has more time to practice." "Some people didn't like dancing. But I bet that they was some people that went to church that if they could get away just right, they'd go dance, too. But I never did dance two or three sets. I always played." There was a lot of fighting at square dances. I was in the middle of a gang fight one night. That wasn't quite funny, though. I told this other guy, "We're Switzerland and Sweden because we are trying to stop it all." They was cutting each other, knifing, you know. But anyhow, the last tune we had played that night before that started was "Big Muddy." They had danced about fifteen minutes, and it all come up over a half pint of whiskey. One guy thought another one had stole it and he hadn't. He'd helped drink it. The ruckus juice, you know. Generally there was a few stragglers that wasn't any too welcome. But as a rule now, somebody would get a little bit jealous of somebody else. I wouldn't take a girl with me. I said if trouble started all I had to do was grab my fiddle and leave. That's right. But I've been to them when they went off just as nice as if you'd been at church. But then I've been that somebody would come. They was always somebody that was just troublemakers. They done the dancing at people's houses. They would go in and the help, as I always called it, moved everything out of the room into the the other room for them to dance in. They'd dance for fifteen minutes for one dance, but that was too long. Your fingers would give out and your shoulders, but we got to where we cut that down to eight minutes. Then we'd have a lunch, and then at midnight they'd have a midnight lunch. Most of them farmers out in the country, now, they really put on a lunch, too. Ham, meat, and strawberry shortcake and I don't know what all. Sometimes we'd have dances for special occasions. They used to have an old wooden bridge at Hurley. They built a concrete bridge just after World War I. Dad give twenty-five dollars for a fiddle for me to play with another old boy for them to dance on the bridge. We played for them, and they really danced on that old bridge. That's how they dedicated the bridge. They had a dance on it. I really enjoyed playing for those square dances and those figures like,"Old Jim Wayne around the ring, Meet your honey with a two hand swing," and "Go straight across the hall" and "Hop up on the corner." They had, "The old pickers inside here and outside there" and "You come here awhile and you go there." I never called none of them. Oh, I played at a many of them. During the Depression, me and this second would get about a dollar and a half apiece for the night until about two o'clock in the morning. But I have played a many a night for six dollars and from nine o'clock until about one. That was pretty good money then. Music has always been my line. Music and riding a bronc pony with a good saddle and driving cattle and running a locomotive on a passenger train. When I was twenty-four years old, I went to firing a locomotive. I used to set and watch the trains go back in 1907 when I was six years old--the first trains that run--and I said I hope someday I can run an engine, which I did. In 1968 I retired and I had been an engineer for right at forty years. Before that, I was a fireman. I was laying here awhile ago hearing one of the old trains go along, and I said to Shorty, "Shorty, listen to that. I used to watch them go through here, and I've been at the throttle of them." One of my biggest thrills was a long passenger train. I did pretty dadgummed good when I got out here on these hillsides firing a locomotive with a shovel. I always had a knack of being pretty dad-gummed good. I told this old sergeant when I was in the army that I learnt to figure when I was a kid by figuring how much my rabbits would bring when they were a nickel apiece when I didn't have no pencils over around Hurley where I grew up. Then another man once asked me, "How far did you go in school?" I said, "Well, the ninth grade." "How come you didn't go any farther?" I said, "Well, they was an old tomcat got in the schoolhouse one night and got to finding a place to answer a call from nature and tore my book up a-scratching it. I didn't have nothing to go on." I don't know whether they believed me! I raised five children, one girl and four boys--two marines, a sailor and one in the army. One of them was wounded in action in Korea. He was in World War II. The other one was on a little ship that was shot all to pieces in the navy in Korea. We celebrated our fiftieth wedding anniversary in 1972 with all the children, all the grandchildren and one great-grandchild. I think that's a record. There's very few that have been married fifty years and have all their children. I was on the railroad just a little lacking forty years. I retired on account of my eyes were failing. I can still play the fiddle because you see, I haven't got much to do with my time any more. We don't have much more company than anybody in Sing Sing. So many has died. There's only one older than me. I play the "Eighth of January" over the telephone to a department store here. Every eighth of January I call up the department store and they put it on their loud speaker. This time I had it taped. I played "Carroll County Blues, .... Sally Goodin, .... Forked Deer" and "Eighth of January." I'm glad to get to do this. The "Eighth of January," that was known way back before my grandpa was born. It's about the Battle of New Orleans. I wasn't around here then. In 1901, that was when I was born. I don't know how many fiddle tunes I do know. I tried to figure one time. It was around one hundred seventy-five to two hundred. Speaking of tunes reminds me. There was an Englishman wanting a fiddler to play "Billy in the Low Ground," and he said, "I say, old boy, can you play 'Wading in the swamps'?" That's like, two Englishmen were getting on a streetcar and this owl was hollering. And one of them says, "What is that?" The American boy said, "That's an owl." He said, "Yes, I know. But what is it 'owling?" I played in a few fiddle contests more than just around here. I went to Idaho to the World's Champion contest and to Texas to a contest, to New Mexico and I don't know how many more. I would win a prize once in awhile, I guess through sympathy. But I've got two fiddles a-laying in there on the bed. One Dad bought me a week after Christmas in 1919. And then one that Shorty bought me in August of 1970, and I still try to play the fiddle. I'm still trying to learn to play one. But I don't know. A fiddle always appealed to me. I probably learned to play from my father. He was particular with his fiddle. I'd catch him gone I'd slip it out and play it, but he didn't want me too Of course, I was just a kid, and he didn't let the kids fool with that fiddle. I learned to play by watching other people at music parties. And then when I got home I just figured it out for myself. I used to play live on the radio. Back in 1948, '49 and '50. I was with radio station, KLWT in Lebanon when they first started. They don't have too many live radio programs anymore. Of course, there's the Grand Ole Opry down in Nashville, but almost every radio station then had a staff of musicians that put on programs. Man, that was really something for a green country boy to be on the radio! We wasn't that good, but everyody listened because the station was new, and we got a lot of mail requests. Musicians often come in families. Jimmy Gage and his son Allen spend many nights playing music. Photo by Dwayne Sherrer. 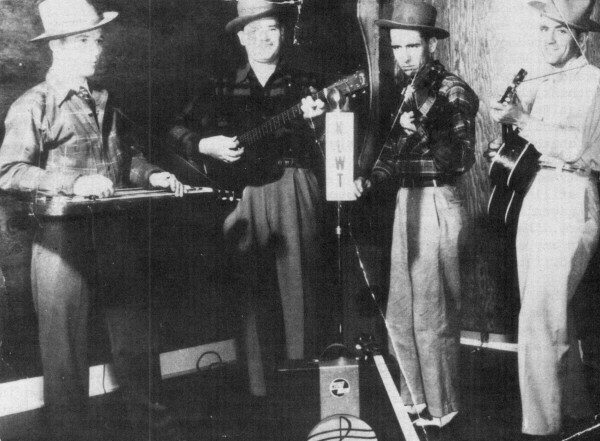 Jimmy Gage (second from right) playing with the Rustic Reveille on radio station KLWT in Lebanon, Missouri, in 1948. Other members from left to right are: Elwood Gann, Ralph Wrinkle and Rhoder Sharp. In our group there was the fiddle, guitar, bass and steel guitar. The Ozark Troubadours. We didn't make any money but we had fun. We had a show at six in the morning--The Rustic Reveille. All of us was about half asleep. At one time I think we had three shows a day. We tried ,to keep up with the new songs that came out at that time. Actually I think more good songs come out then than they come out with now. The night before the station officially opened, we got out there at about two o'clock in the morning and played till they checked it out. It opened July fourth in '48. The closest radio station before then was KWTO in Springfield. We only had 250 watts, and since then they have increased the wattage to 1000 watts and also F.M. It's surprising though sometimes how far that 250 watt station reached. We'd get mail from a large area around Warsaw, Richland, Camdenton and Hartville. One time we got a card from a lady in Texas. She was a songwriter, and she sent us one of her songs and said she'd like for us to use it on one of our programs. She sent us a self-addressed card and told us when we used the song to let her know. So I don't know, she must have had a real good receiver. When we started at the radio station they was still a lot of country schools around and they still had pie suppers. Of course we got a lot of advertisement, because when we'd play we'd mention it on our radio program. Then people wanted to go to the pie suppers to see the big radio stars! The most money I guess we ever made playing was when my wife was still in high school and the senior class sponsored us! We went down there on a percentage basis of what was brought in at the door. Well, when we got through and figured up what we made, we come out with fifty cents apiece! They didn't even pay for our gas there. But we all got a kick out of that--making fifty cents apiece. We played just about every Saturday night somewhere. We had music parties. We'd play here one Saturday night, and then before we left we'd decide where we'd be next Saturday night. I played at the skating rink back in 1944, '45 where they square danced. You've probably seen the modern square dance they do now. But it's nothing like the way they used to do it. They really used to get with it. They danced! I like to see old-time square dancing. Playing for square dances is not anything where you can make money. How would you like to go in at eight and play till twelve for five dollars? They didn't pay us when it was in the homes. Well, they might take up a collection to pay the fiddler. Maybe it might be one, two, three dollars--whatever they wanted to give. But I got paid down there at the skating rink five dollars a night from eight o'clock till twelve. Some of those square dance sets would last maybe fif--teen or twenty minutes. That same tune over and over. My dad, well, he played a lot of square dances. Dad didn't play for pie suppers. About all he played for was square dancing. They had square dances in the homes. They'd just move the furniture outside. Some of them would dance all night. They'd be dancing when it come time to milk in the morning. I've never been to one of them where they danced all night, but I've heard them tell about it. After I quit playing at the station, why, I just quit playing for six or seven years. Then we got a little group together and started a country music show over here where the old city hall used to be. And at the same time a group at Marshfield started a show up there. We had two shows a month. We'd have the first and third weekend, then they'd have the second and the fourth Saturday night up there. They'd come down and work with us and we'd go up there and work with them. Then after we quit that I didn't play for quite awhile. Then Kenneth Pitts that run the Pomme De Terre Opry said he had some shows he wanted me to play if I could. I was surprised, really, when I was over at the Opry, at how many people like fiddle tunes. I guess '78 was the last year I played over there, and it was every Saturday night. I've had all kinds of seconds. When I played at the skating rink we had a gal that played the piano. We had the guitar and the piano and the fiddle. I guess people then used whatever they had. If they had an organ, why they played the organ. If they had a piano, they played along on it. 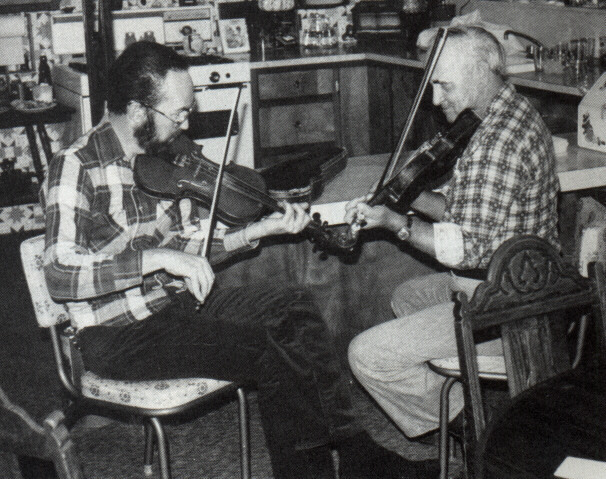 Dad and another fiddle player used to get together and set and play two fiddles. They didn't have radios yet. They was learning them fiddle tunes from each other. The only fiddle playing I heard was just when we got together and played. A lot of the old-time fiddle players like my dad played lots of tunes, and if I'd had the tape recorder and taped all the tunes that he played, it would have been good, because they're lost. Now some of them I remember and some of them I don't. But some of them old-time fiddle players generations before me, they played tunes that these younger fiddle players probably never heard. Bluegrass bands are sticking closer to the good country music more than any of the other bands. They don't use any electric instruments. I play all kinds of fiddle music, I like the old-time tunes and bluegrass--fiddle tunes to listen to and to dance to. I don't know what my favorite instrument is. I don't really play any instruments, I just saw around on them. Fiddle, guitar, banjo, mandolin, bass. The fiddle is probably my favorite. It's harder to play than the guitar. I guess it's more of a challenge. Bittersweet has written other features on fiddles and square dancing. See "Old-Time Ozark Square Dancing" and sound-sheet, "Old-Time Square Dancing," Vol. II, No. 2, pp. 22-36+ for a comprehensive coverage of square dancing including calls and directions for sixteen traditional dances; "Fiddlin' Around" and soundsheet, "Fiddle Tunes," Vol. V, No. 2, pp. 63-70 for directions for making a fiddle; "We've Got a Pig in the Parlor," Vol. VI, No. 1, pp. 49-61 for music and directions for sixteen play party games. All these issues are still available for $2.50 each plus postage. We wish to acknowledge the help of Gordon McCann who inspired the article, gave us much background information and drove us to the homes of the three fiddlers on our soundsheet. Other sources include: Ford, Ira W., Traditional Music of America, E. P. Dutton and Company, 1940. Wixson, Douglas Charles, "The Oral Tradition of Fiddle Music in Early Days of Radio," Missouri Folklore Society Journal, 1979, p. 2. Gilbert, Joan, "Country Fiddlin," Missouri Life, Nov.-Dec. 1975, pp. 40-47. "New England Traditional Fiddling--1926-1975," The John Edwards Memorial Foundation, Incorporated recording.